Opened in 2006, The Massachusetts Animal Medical Center (MAMC) is a full-service veterinary with a team of profesionals dedicated to the health and well-being of dogs, cats, and other small animals. Your pet will receive the highest quality medical care with state-of-the-art equipment and efficient administrative tools that make vists to MAMC pleasant, convenient, and affordable. Our 18,000 square foot facility offers comprehensive care for dogs, cats, and other small animals, with a caring and dedicated staff, comfortable accomodations for your pet, plenty of off-street parking, and a pleasant waiting room. 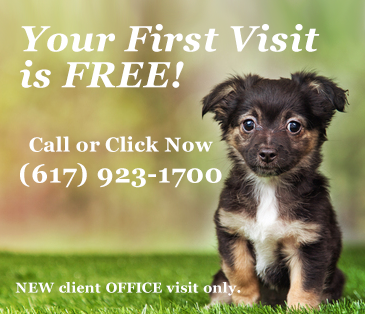 At Massachusetts Animal Medical Center we offer comprehensive veterinary services that cover all aspects of routine wellness care, as well as surgery and specialized medical care. To make caring for your pet even more affordable and efficient, we offer Wellness Programs for cats and dogs that covers essential preventative care that you pet needs. In addition, you will receive discounts on services, products and medications. We use the latest tools and technology in diagnostics, radiology and surgery to quickly diagnose, treat and monitor all common and many serious medical conditions. Our pharmacy and on-site retail shop makes it convenient to provide any medication and/or prescription diet food your pet may need. We also offer medical and geriatric boarding services, providing a quiet, relaxed environment and individualized TLC for pets with special needs. These patients are given extra attention by our veterinary technicians and are supervised by our doctors. Grooming, general boarding, and pet daycare services are conveniently located at Toureen Pet Resort and Spa, next door to our facility. You can reach them by phone at (617) 923-3800 or visit them online. As your pet matures from a puppy/kitten to an adult onto a senior, we offer comprehensive wellness strategies that will enable you and your furry friend to plan for each life stage and the unique health needs associated with each stage. A vital part of the exam is the discussion between the client and the professional care giver at MAMC. Massachusetts Animal Medical Center laboratory provides fast and accurate information so that your pet can receive appropriate treatment immediately after arriving at the hospital. When more sophisticated testing is required, we utilize a certified veterinary laboratory offering the expertise of board certified specialists in pathology, hematology, internal medicine and radiology. For your convenience we can also schedule in-house veterinary specialists in several different fields including internal medicine and cardiology. No procedure is routine when it comes to surgery at Massachusetts Animal Medical Center. Our team of doctors and surgical technicians provide an individualized anesthetic and pain management protocols for each pet undergoing surgery. For your pet’s safety, our operating suite is equipped with the latest in veterinary monitoring equipment including EKG, blood pressure, oxygen saturation, temperature, heart rate and respiration rate. Massachusetts Animal Medical Center is able to perform most surgical procedures from spays and neuters to more complicated abdominal surgeries, mass removals and some orthopedic (bone and joint) procedures. We take pride in our equipment and our modern anesthesia and patient monitoring systems. Dental disease, specifically periodontal disease, is the most common ailment affecting pet dogs and cats. At Massachusetts Animal Medical Center, we feel it is very important that our clients realize the impact dental care can have on their pets overall health. Massachusetts Animal Medical Center carries an extensive inventory of veterinary pharmaceutical items, supplies, and medications. For the convenience of our clients we have the ability to treat your sick companions right away. We do honor requests for scripts but do not deal directly with any online pharmacies. The treatment of many conditions often requires the feeding of specialized veterinary diets. We carry a variety of Hills Science Diet and Purina prescription foods. If you need a special item please let our staff know and we maybe able to accommodate. For our Science Diet customers we order on Mondays so please call early to get your order in. If you’re planning a vacation or handling a family emergency, MAMC now offers medical boarding. If your animal has a medical condition or is elderly and requires more immediate attention we are able to assist. Limited space is available so that we can accommodate those special boarders. We require a physical exam by one of our veterinarians within the last 12 months, so that we are aware of any conditions that your animal has. We take the health of our boarding pets very seriously. All pets admitted to the hospital must be current on all required vaccinations. For boarding of pets without special needs, or for grooming or pet daycare, please see Toureen Pet Resort and Spa, conveniently located next door to our facility. Your pet’s health and comfort are our top priorty. Our team of knowledgeable and experienced animal care professionals work together to ensure a safe yet efficient experience each time you visit. Caring for patients at Massachusetts Animal Medical Center. Dr. Callanan grew up in Belmont, Massachusetts and attended the college of the Holy Cross. He received his B.A. from Holy Cross in 1998 majoring in history. He was also the captain of the men’s ice hockey team. After graduating, Dr. Callanan spent two years abroad playing professional hockey. Dr. Callanan would hang up his skates and work at the family practice until his acceptance to veterinary school. Like his father before him, he would receive his degree in veterinary medicine from the University College Dublin. After graduation in 2008, he would join the family practice. He currently lives in Waltham with his wife, two children and their dog, Bruschi. Dr. Adam Boardman is a 2010 graduate of Tufts Cummings School of Veterinary Medicine. He has been with MAMC for 3 years. Dr. Boardman has a communications degree from Ithaca College and he spent 10 years working in the Boston television news industry. He found it wasn’t his true calling and decided to pursue his dream of becoming a veterinarian. He enjoys golf, distance running and spending time with his family. He is the proud owner of 2 rescue mutts – Archie and Spirit. He also has a three-legged cat, appropriately and lovingly named Pogo. Caring for patients at Massachusetts Animal Medical Center and Union Square Veterinary Clinic.